A new public-private group is trying to reduce environmental impacts on a district-wide scale downtown. By now most people have heard of green buildings  structures with LEED certification that use less energy and less water than their peers. From lower utility bills to higher indoor-air quality, adoption of green buildings has changed much of the standard practice of new construction in the past decade, and that is a very good thing. However, if we are really serious about tackling our future environmental challenges, we must move beyond individual buildings to district-scale thinking, which is what is happening in Seattle right now. District sustainability currently experiences the same limited level of awareness that individual green buildings did a decade ago, when the U.S. Green Building Council announced its first 12 LEED-certified projects. There are now over 11,000 of them across the country. Seattle District 2030 members representing more than 23 million square feet of downtown building space are working together to reduce their environmental impacts. Statistics abound regarding our global population’s urban shift, with two out of three people born in the next 30 years projected to live in cities. Let’s take a look at local trends: From 1996 to 2010, King and Snohomish counties added a lot of apartment units, and 57 percent of them went to the suburbs. Currently, only 29 percent of apartment units in these counties are located in Seattle, the balance exists outside of it. Future projections show a huge reversal of this trend. Over the next three years, the red-hot apartment segment will add thousands of units to King and Snohomish counties, and a whopping 85 percent of those units will be in Seattle. Is this a good thing? After all, most people picture cities as places that consume huge amounts of energy and water and generate plenty of air pollution. However, current city dwellers consume far fewer resources per capita and emit far less into the atmosphere than their suburban and rural counterparts. Dense cities create opportunities for services like mass transit and district energy that do not work in spread-out suburban areas. Cities are the future, and projects like the Seattle 2030 District will make that future brighter than suburban promises of yore ever dreamed of. Seattle is charging into this future with the Seattle 2030 District, a public-private alliance between the city, King County and dozens of private-sector leaders to aggressively reduce the consumption and environmental impacts of buildings over the next 18 years. A large number of downtown buildings, totaling more than 23 million square feet, are taking advantage of their density and proximity to one another, working together to reduce their energy use, water use and transportation emissions to half of benchmark levels in existing buildings by 2030. Performance targets for new buildings are even more aggressive, and envision carbon-neutral construction in Seattle by 2030. After 18 months of discussions and startup funding from the U.S. Environmental Protection Agency, more than 60 founding members, including building owners and operators, architects, engineers and community stakeholders, formed a nonprofit organization to deal with these challenges in a revolutionary manner. They are targeting the same goals and openly sharing information that is vital for the group’s success, including best practices, challenges and consumption data. For decades, it’s been cheaper to displace human labor with fossil fuel energy in the U.S., and we’ve followed that trend to its logical economic conclusion: high unemployment and rising energy prices. Yet thanks to those rising energy prices, projects to make buildings resource-efficient can more convincingly provide faster financial paybacks and higher asset values for building owners and investors. Reducing energy use and achieving those paybacks will require the efforts of conservation managers, building auditors, manufacturers and installers of more efficient equipment  in other words, the green jobs we’ve all been hearing about. These conditions, paired with the right partnerships, technologies and financing solutions, increase our ability to scale efficiency projects more broadly. 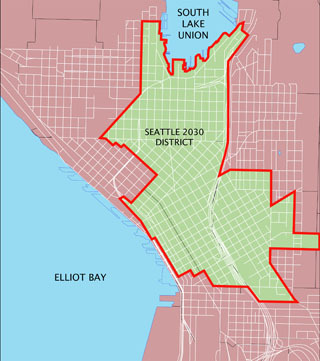 The Seattle 2030 District aims to be the catalyst making this new scale reality. LEED for New Construction and energy codes across the country predict energy and water consumption based on analyzing a building’s design details. They do not actually measure what buildings do in the real world as part of LEED certification or code compliance, and as we hear about fuel-efficient cars  your mileage may vary. The industry is slowly shifting focus towards real-world data for buildings. The EPA’s Energy Star program and LEED for Existing Buildings are creating a knowledge base of buildings’ performance in practice. Locally, Seattle is one of four U.S. cities requiring property owners to share basic energy use data with the city. Seattle 2030 District members are taking this concept one step further. Participating property owners will track their performance and share their data in an online dashboard for the entire district, and it goes live in March. Anyone can surf to our website and see our progress towards our goal. People can also read detailed case studies about top-performing buildings within the Seattle 2030 District, highlighting their excellent performance and the major steps taken to achieve it. Last fall, our board of directors held a retreat to determine the district’s priorities over the next few years. We began the day with a visioning exercise to focus our large and diverse 21-member board, asking everyone to write a postcard to a loved one in the year 2030, describing the qualitative aspects of downtown Seattle as if seeing it for the first time. Responses across the board described a place with pedestrians and bicyclists everywhere, stunningly clean air and water, children playing, salmon teeming along the waterfront, and very little noise and vehicular traffic. When people ask for a more concrete description of the Seattle 2030 District’s performance goals, this vision is the answer: a place where everyone will want to live, work and play. The project is already gaining national attention. Last year, the 2030 District was selected by the U.S. Department of Energy to represent Seattle, along with Los Angeles and Atlanta, in President Obama’s Better Buildings Challenge. By 2020, this program aims to reduce commercial building energy consumption by 20 percent nationwide. Of course, one city can’t impact the global environment alone. That’s why the Seattle 2030 District’s performance goals are based on a nationally recognized standard, the 2030 Challenge for Planning, and a public-private partnership framework as a replicable model to kick-start urban transformation all over the country. Last fall, a second 2030 District got under way in Cleveland. More are gearing up in other cities, making the future for all of us city-dwellers look very bright indeed. Brian Geller is the executive director of the Seattle 2030 District. Does a green retrofit make sense for your building?